Vintage from Paul is pleased to offer this Jackson China Jessica Restaurant Red Transferware Creamer. The pristine restaurant ware white body is decorated with a red transferware floral pattern. 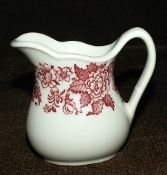 The Jackson China Jessica Restaurant Red Transferware Creamer measures 3-3/4 inches from handle to spout, has an upper opening diameter of 1-3/4 inches and it stands 3-1/4 inches in brim height. Each of the available Jackson China Jessica Restaurant Red Transferware Creamer is in pristine condition as these teapots appear to have never been used. The Creamers are marked with Jackson China Falls Creek Pa., V-6".